And our Medea-Underdominance manuscript is also out in print! Right on the heels of the last paper our theory results on a combined Medea-Underdominant dynamics is finally published. Like the last one this took several years going from journal to journal and through a long line of reviewers before finally getting published. Chaitanya really deserves the credit on this one for making the final push to resubmit yet again and get it out there. This entry was posted in Uncategorized on May 25, 2014 by Floyd A. Reed. 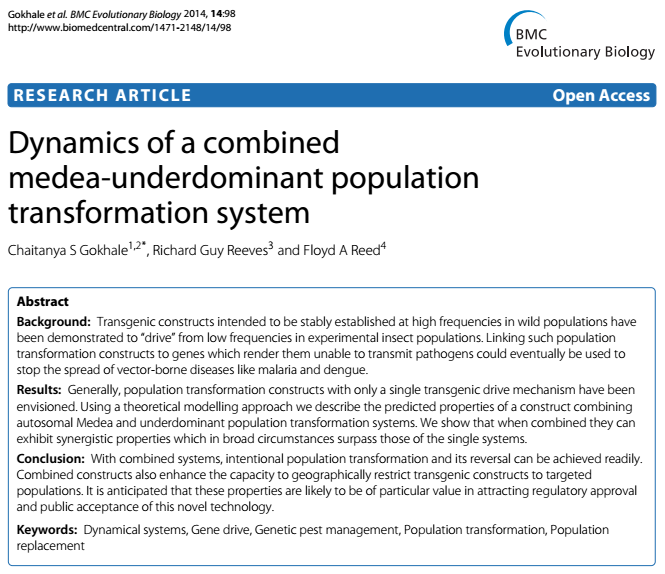 Our population genetic engineering paper is published! 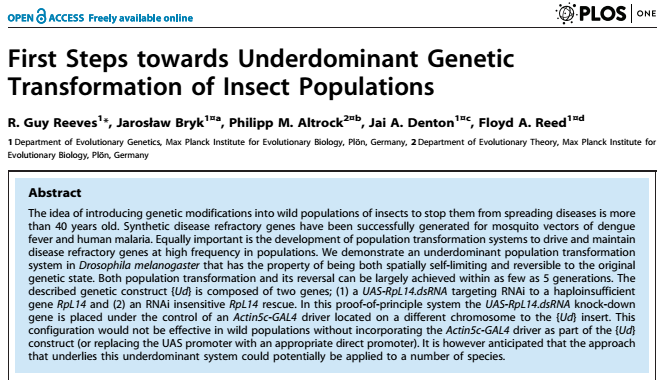 At long last, our paper describing engineering underdominance in Drosophila with haploinsufficient poison/rescue is out! Here is a link to the full article. In other news, classes and committee work are finally done, so I can have a chance to get back into the lab. My preproposal to NSF was turned down again but a preproposal to NASA has made it to the next stage to submit a full proposal! This entry was posted in Uncategorized on May 22, 2014 by Floyd A. Reed.